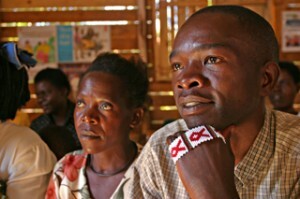 Communities are learning about prevention and treatment of HIV, and the role of men. PWS&D programs aim to teach people how to prevent the spread of the disease, while providing treatment, counseling and care for those living with it. The programs also help pastors and lay leaders provide necessary pastoral care and teach social acceptance of people living with HIV. Acclaimed photographer, entrepreneur and motivational speaker, Carl Hiebert was inspired to visit Malawi by a community health nurse in charge of the PWS&D-supported AIDS program at Malawi’s Ekwendeni Hospital. Donating his time and talent to PWS&D in 2004, Carl took up the opportunity to visit the African country, along with the challenge to capture through his camera lens the story of those living with and affected by HIV and AIDS. In a world where 33 million people live with HIV and AIDS, Carl discovered the story of HIV was more than just one of despair, but one of courage, tenacity, love and compassion. Confined to a wheelchair since 1981, he identified well with people who face and continue to overcome many challenges in their daily lives. PWS&D continues to share this hopeful story by spreading awareness in Canadian congregations through the HIV and AIDS photo exhibit.